All kinds, all applications. If it’s a slide bearing we can manufacture, revise or repair it. 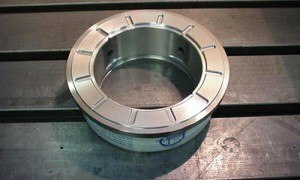 At high rotational speeds, slide bearings are applied instead of plain or roller bearings. Not only does the oil in the slide bearing acts as a lubricant but it also has a vital cooling function. Working together, oil-pressure and rotational speed cause a full-film lubrication between the axle and the bearing without metal contact between the axle and the bearing cup. As a result there is no wear which means no maintenance and therefore no standstill. Radial/axial bearings, 4-point bearings, lemon-shaped bearings, off-set bearings, tilt pads and thrust pads. Slide bearings are available as radial / axial bearings, 4-point bearings, lemon-shaped bearings, off-set bearings, tilt pads and thrust pads. and in many other designs. They run quietly and are particularly suitable where high loads must be supported under relatively slow rotary and swivel motion and at low and high temperatures. Slide bearings are, depending on the material used, maintenance-free or very low-maintenance. Application of slide bearings in marine and diesel engines, electric motors and generators, turbines, gear casings and concrete mixers. 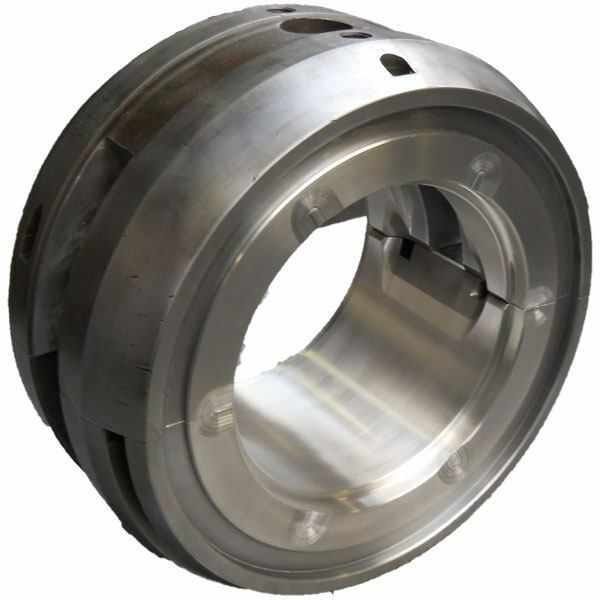 Due to their specific characteristics, they are therefore used in almost all areas of industry and especially where there is very limited space available for the bearing arrangement. For example, you can find slide bearings in marine and diesel engines, electric motors, turbines, gear casings and concrete mixers. Ultrasoon DIN ISO 4386: Every order is executed with acknowledged quality standards. Know how: Bootsman is the leading slide bearing specialist of the Netherlands. Expertise: People always make the difference. Only experienced specialists work at Engineering Bootsman. Modern machinery: We work with the most modern CNC machinery for the best results. Fast and reliable delivery: We ensure that we deliver on time. Leading customers: Engineering Bootsman supplies to many big and smaller customers, each leading in their branch of industry. 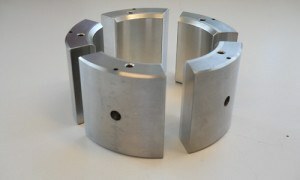 We manufacture these bearings from 10 to 1,000 mm. These bearings are made of white metal or bronze. We are specialized in custom-made bearings. Radial/axial bearings are known for their countless applications as motor and industry bearing. They are very suitable for a rotational speed up to 3,000. 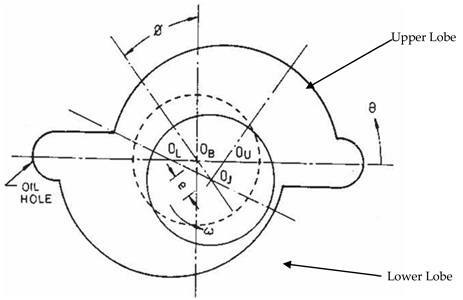 Radial/axial bearings are particularly suitable for bearing arrangements with high requirements for running accuracy. 4-point bearings are single row angular contact ball bearings and therefore require significantly less space in an axial direction than double row designs. More oil can flow through the bearing because of the space between the four points. This provides for better cooling which in turn supports a rotational speed of 5,000 to 9,000. 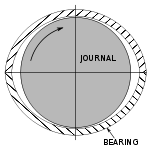 These bearings consist of a number of pads which together form a ring. Every pad is able to turn freely on the underlying ring. 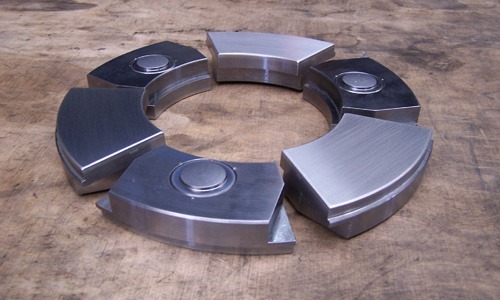 Thrust pads are mainly used for crankshafts, crests and steering shafts in the shipping industry and turbines. A tilt pad bearing consists of sectional pads on points of rotation where the pressure of a fluid (like oil) causes a slight tilt and slightly separates the moving parts. The tilting of the pads automatically adapts to the supporting load and speed. Tilt pad bearings are mainly used in heavy turbines, generators and propeller-shafts of ships. Tilt pad bearings are very suitable for rotational speeds above 9,000. 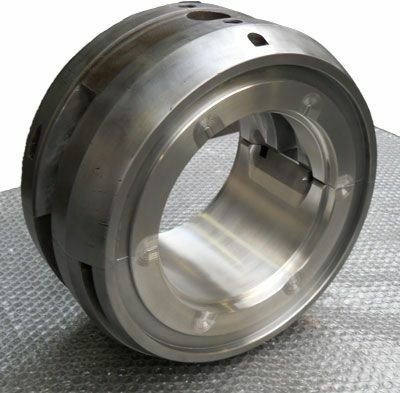 A lemon-shaped bearing is a bearing with a non-cylindrical design which improves the stability of the axle, reduces the loss of power and improves the oil flow. Lemon-shaped bearings are very suitable for rotational speeds of 3,000 to 5,000. 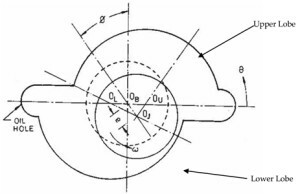 In an off-set bearing the two halves of the bearing are not placed directly on top of each other, but slightly displaced relative to each other. This kind of bearing is mostly used to connect a turbine with a generator.